Since being described last year, the Multilined Pufferfish (Arothron multilineatus) has quickly established itself as one of the most mysterious and poorly understood species of Indo-Pacific reef fish. 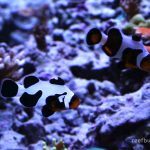 For such a large and showy creature, remarkably few specimens have ever been documented (although one did recently enter into the aquarium trade via the Philippines). Given how prominent and extensively photographed this genus is in the wild, the sudden recognition of a new species came as quite a shock, but, as I’ve previously discussed, there is considerable reason to doubt its validity. 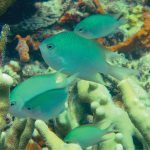 Previously, this fish has only been known from the Red Sea, the Coral Triangle and Japan, but a recently published observation from the Eastern Pacific is raising new questions. With this record, we now have “multilined” pufferfishes from across the entirety of the Indo-Pacific, from the Red Sea in the west to Japan and now Mexico in the east. For such a widespread and flamboyantly colored creature, we would expect to have far more than just a handful of sightings and specimens. This certainly holds true for Arothron hispidus, the White-spotted (or Stars & Stripes) Pufferfish. 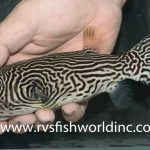 This is the only other species in the genus with such a broad distribution, but, unlike its rare multilined cousin, A. hispidus is known from a vast number of specimens and photographs and is exported in huge numbers for the aquarium trade. So how do we explain this disparity? Why is one widespread pufferfish common as dirt and another seemingly rarer than a diamond? The most logical answer is that A. multilineatus represent nothing more than an uncommon hybrid, and, sure enough, a quick examination of the few known specimens shows that they exhibit a large amount of variation. 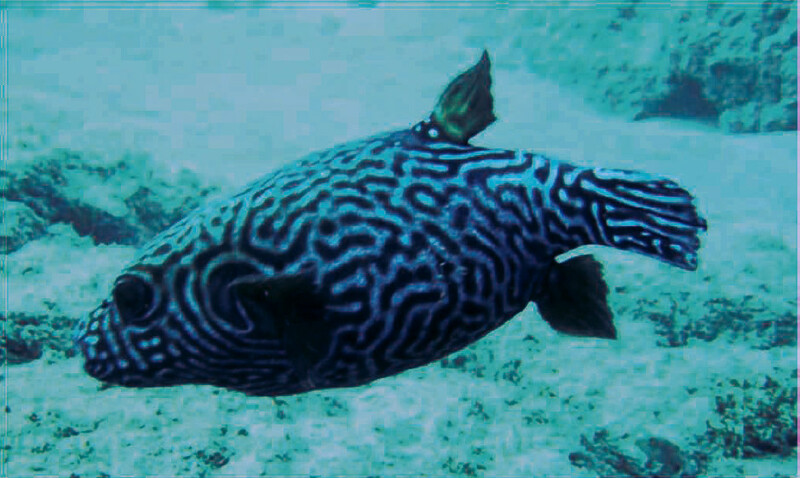 No doubt, some of this is related to the relative size of these individuals, as larger pufferfishes tend to look dramatically different from juveniles in this genus. But, even accounting for this, the differences observed are more than we would expect if this phenotype was representative of a true species. In some individuals, the body is marked with relatively thick and straight black lines, but, in others, the body is mostly grey dorsally, with a fine reticulation of white lines throughout. Among this latter variation, we find even more variability, as some are marked in a far more linear fashion… some have spotted (versus reticulated) caudal fin patterning… and a few exceptional examples have additional intercalating spots along the body. In essence, there is no single “multilined” pufferfish, but, rather, a whole spectrum of them. 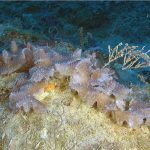 To deduce what the hybrid parentage might be, we need to examine where these specimens have been encountered and what species correspond to these regions. In the Red Sea, the only documented examples are of the grey, maze-like form. Three species occur here—A. 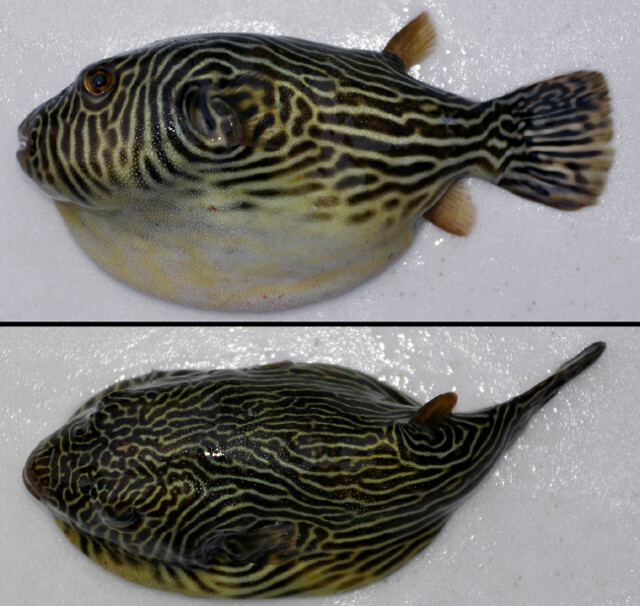 hispidus, A. stellatus and A. diadematus—and a quick examination of these suggests it is the Starry and White-spotted Pufferfishes which are potentially interbreeding to produce these aberrant specimens. On the other hand, the only known individual in the Eastern Pacific is of the thick-striped form, and, here, we find only A. hispidus and A. meleagris. 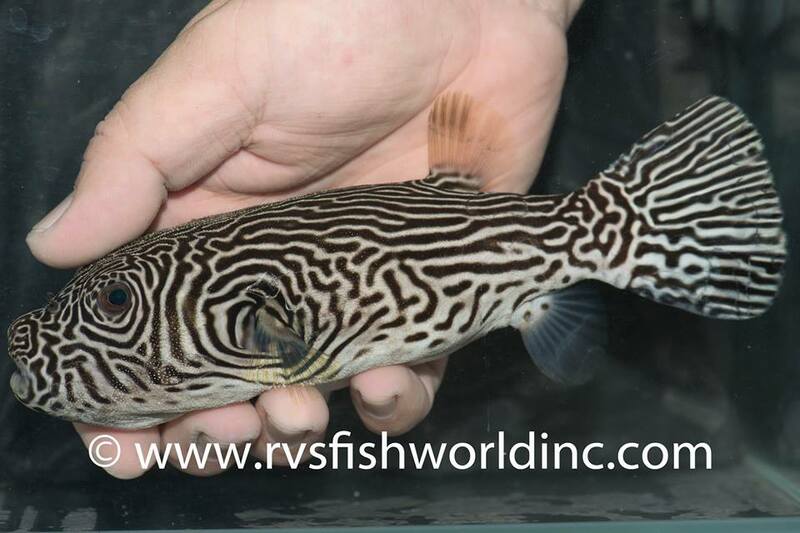 This obviously rules out A. stellatus as a parent species and instead suggests that we are dealing with either a Guineafowl X White-spotted Pufferfish hybrid or perhaps just an unusual (and rare) aberration in one of these species. But without actually sequencing some DNA, it’s difficult to say which of these is the more likely scenario. 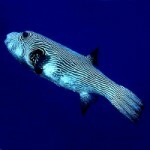 Similar examples have also been encountered in Japan and the Philippines, but those tended to have more linear markings and lacked the white spots seen near the mouth and dorsal fin of the Mexican specimen. 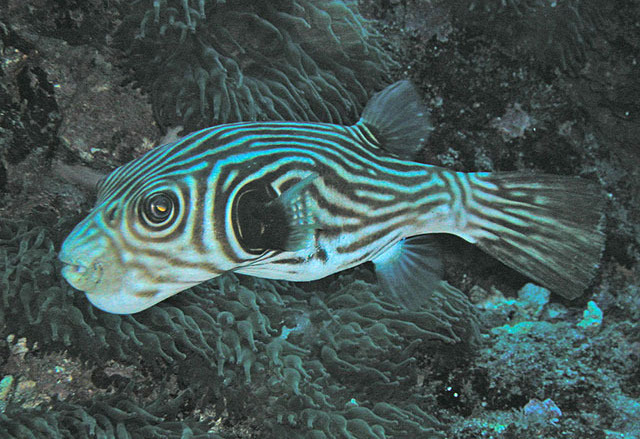 And relevant to this discussion is Arothron carduus, an even rarer species that has essentially the same appearance. It was claimed in Matsuura 2016 that the two are differentiated by their inverted color schemes (i.e. a white body with dark lines in A. carduus vs. a darker body with white lines in A. multilineatus), but, with only three (3!) specimens of A. carduus ever reported, it’s hard to see this as anything other than another level of variability in a more general “multilined” phenotype. But, still the question remains, what causes this multilineation? Without genetic data, it’s probably presumptuous to attempt to answer this vexing question, but it never hurts to offer a thought-provoking hypothesis. In my estimation, neither A. multilineatus nor A. carduus make any sense as valid species; both are simply far too rare and variable relative to the other members of this group. The Mexican specimen really does look like it might just be a weirdly mutated A. meleagris, and any similarity to specimens from elsewhere in the Indo-Pacific is perhaps just superficial. With that said, all of the previously documented “multilined” pufferfishes are likely hybrids of A. stellatus and A. hispidus, and the differences observed among these likely relate to their relative size, as well as the usual genetic noise that accompanies hybridization. With each new “multilined” specimen discovered, we are slowly but surely learning a little bit more about the natural variability present in Arothron, and, hopefully, we’ll someday get a definitive answer for how this pufferfish earned its stripes. Matsuura, K., 2016. A new pufferfish, Arothron multilineatus (Actinopterygii: Tetraodontiformes: Tetraodontidae), from the Indo-West Pacific. Ichthyological Research, 63(4), pp.480-486.